The Friends share in the life of the Cathedral by their interest, their prayers and their service. 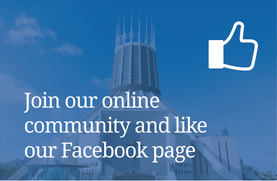 Anyone can become a Friend of the Metropolitan Cathedral and we would very much encourage you to do so. Opportunity to partake in Annual Friends’ Mass. For more information, download our Friends of the Cathedral Welcome Leaflet. Alternatively, please email us at friends@metcathedral.org.uk.